@cogdog Looking for a way to export FWP list to another site. Not that I'm lazy, well.. but maybe there's a post that isn't on WP org site? Basically to export the sites you have in a Feed WordPress site, all you need to do is export the WordPress links, that us a kind of data originally built into the software when people were big on doing these things called blogrolls (a list of recommended blogs). Links are a useful thing I have used time to time to built collections of sites, you can put them in categories and use widgets/shortcodes to push them to your site. On the bottom right of my site are two widgets to list sites “other webs” and “stuff I’ve made”; these are generated from the link structure. Rather than manually enter URLs in an editor, I put them in the links, create a category, and wham! I can tell wordpress to display all links in the “stuff I’ve made” category. Well Feed WordPress stores all of the sites you add to it as links too. It stuff a bunch of other data in the notes field. And 1-2-3 Google it and I found that WordPress has a built in way to export those links and then re-import them into another site. 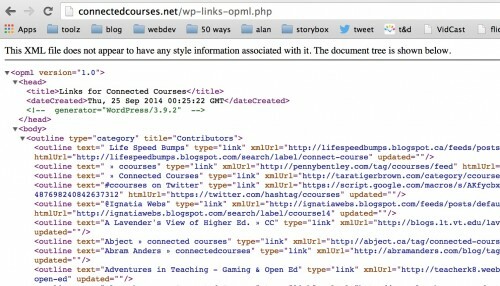 You can see this in action just by taking wp-links-opml.php on the end of the home url of a WordPress site, so you can see all the ones for Connected Courses by going to http://connectedcourses.net/wp-links-opml.php. You can then use the WordPress Import tools to bring those into another site. 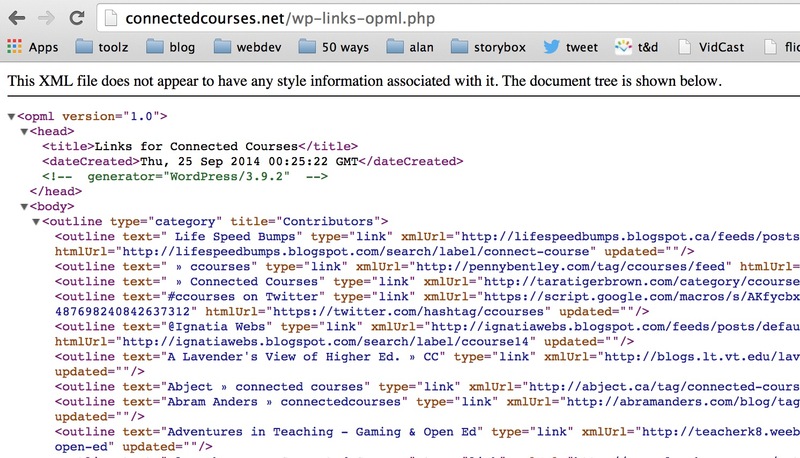 Now I have already built a custom coded bit into the Connected Courses site to generate an OPML file for all syndicated sites (see right side of http://connectedcourses.net/all-blogs/). I am thinking that is still better than this WordPress thing, (on a quick check, I see duplicates or inactive feeds). I hope when I get in one place to turn my custom code into a plugin. But this WordPress OPML-links tool might help Ben in a pinch. Just letting you know I’ve used this twice in the last few days and it saved me all kinds of hassle. Keep on making the world a better place.